Originally published on the ICRISAT website. 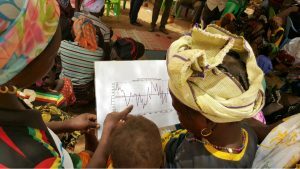 To increase the availability and accessibility of quality climate data in Mali an initiative titled ‘Enhancing National Climate Services’ (ENACTS) was launched recently. For the purpose, a workshop was held to introduce stakeholders to Mali weather station’s new data and web interface called the Mali Meteo Data Library and solicit their feedback. The ENACTS initiative seeks to address the problem of declining quality of station climate data. A security crisis in the northern half of the country adversely affected climate data availability, particularly since 2012, which was further compounded by the low density of the weather station networks. The initiative focuses on the creation of reliable climate information suitable for national and local decision making. Its main objective is to improve simultaneously the availability, access and use of climate information. The crux of the approach lies in collaborative work with the National Meteorological Hydrological Services (NMHS), blending national observations with satellite and other proxy data to improve the quality of their database and extend wall-to-wall coverage on a 5km grid.